One of my favorite books I've received lately is this handsome, considered little tome from Spain's Blur Ediciones, Rotulando in Spanish • Lettering en Español, collecting something that on the face of it might sound a bit loopy: lettering by the cartoonist Nono Kadáver created for the Spanish editions of work by American greats R. Crumb, Daniel Clowes, Joe Sacco, Johnny Ryan, Peter Bagge and Gilbert Shelton. Nono worked throughout most of the 1990s at Barcelona's Ediciones La Cúpula, one of Spain's leading comics publishers, and was one of the last of an era when book production was done largely by hand, not computers. Nowadays, most publishers get fonts created for an artist, but thru the 1990s, Nono spent many of his days mimic-ing the lettering styles of Bagge, Crumb, etc. the old fashioned way, with a pen and paper (and maybe a lightbox). He was a real master at trying to maintain the integrity of the original artwork, putting his ego aside in an effort to seamlessly blend the Spanish text into the artist's page compositions as unnoticeably as possible. 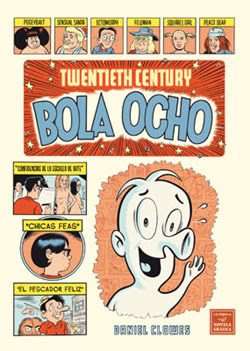 Kind of like the old saw that the best movie soundtrack is the one you don't notice, Nono's work could probably make you forget that Daniel Clowes wasn't Spanish when you're reading Bola Ocho. "I feel a great admiration and respect for counterfeiters… I think that even falsifying, we leave our mark… What you have to do is forget your personal style and adapt to the artist's. This is accomplished by reading a lot, dissecting his work, and learning from it; in the end the only thing that matters is as close a possible resemblance to the author's style." UPDATE: Here's a direct link for ordering.